The Denver Nuggets grabbed a crucial win over the Milwaukee Bucks in stunning fashion. It seemed like the Bucks were on their way to another win when the Nuggets pulled the rug from under them and stole the W.
Milwaukee was up by 10 with less than four minutes left in the game when Giannis Antetokounmpo fouled out. But they had more than enough firepower on their team with Eric Bledsoe, Jabari Parker and Khris Middleton. Denver chipped away at their led until it was just down to three points in the dying seconds. They had a chance to ice the game but Middleton threw away the ball when Murray picked off the inbound pass. Murray was fouled taking a three-point shot and cooly sank all his three freebies. 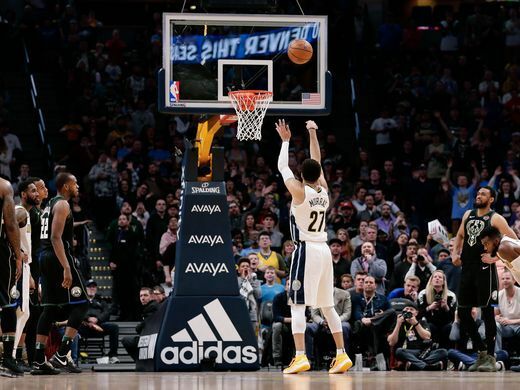 The Bucks had a chance to still win the game with 2.8 seconds left but they threw the ball away again, allowing Nikola Jokic a chance to win the game at the buzzer. Jokic’s hail mary hit back iron, sending the game into OT. In OT, the Nuggets jumped out to an early five-point lead and hit clutch shots to pull away with the win. Jokic led the way with a monster game. He finished with 35 points, 13 rebounds, five assists and three blocks. The Nuggets are now just a game away from the eight seed after their win and the New Orleans Pelicans’ loss today. Milwaukee, previously at seventh, drops to the eight seed in the East. The OKC Thunder were on a three-game losing streak and desperately needed a win. They lost home court advantage in the first round in their loss against the San Antonio Spurs. If they wanted to keep any hope of making a run at the fourth seed, they needed a big win to snap their losing streak. The MVP reeled off another triple-double, his 24th for the year to lead the Thunder to a big win over the Pelicans. OKC remains half a game behind the Spurs for the fourth seed. The Pelicans drop to the eighth seed with this loss. A few days ago, the Pacers secured their slot in the 2018 Playoffs. A team that was largely written off before the season have become one of the most exciting and successful teams, not only in the East, but in the entire league. With their spot secure, the Pacers are looking to continue to rise up the East, where they previously occupied the third seed. Indiana won their fifth straight game and their third in this road trip. Victor Oladipo continues to play at an All-Star level. Against the LA Clippers he dropped 30 points and 12 assists. The Pacers are currently in the fifth spot. But they’re only a game away from the third seed and half a game below the Philadelphia 76ers for the fourth seed. Even with Joel Embiid sidelined by an injury to his face, the Philadelphia 76ers continue to roll. Ben Simmons filled up the stat sheet once again to lead the Sixers past the Charlotte Hornets. He nearly had a triple-double with 20 points, eight rebounds and 15 assists. If Philly continues to roll, this should cement Simmons’ bid for the Rookie of the Year. He’s in a neck-and-neck race with Donovan Mitchell who’s leading the Jazz out West. But with Embiid missing the rest of the regular season, Simmons has a chance to lead the young team up the East and erase all doubt as to who the RoY is. Last year, the Houston Rockets set the record for most numbers of three-pointers in a season with 1,181 made treys. This year, the Rockets break their own record, hitting 1,182 shots from beyond the arc with still five games left in the season. They’re on pace to finish with more than 1,200 treys made this year. Unfortunately, their three-point shooting wasn’t enough as they lost to the streaking San Antonio Spurs today. Yup! Andre Drummond got into a scuffle with Quincy Acy and both of them were ejected in today’s game.